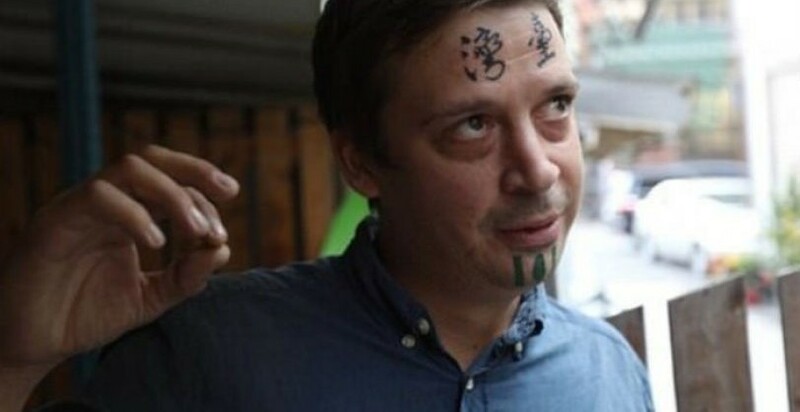 A British expat living in Taiwan angered his wife when he made the drunken decision to tattoo the island’s name on his forehead in huge Chinese characters. Paul, 32, is said to be an avid supporter of Taiwan’s sovereignty movement, but he shocked his Taiwanese wife when he came home with the words ‘Tai’ and ‘Wan’ inked on his head and the country’s independence flag tattooed on his chin. 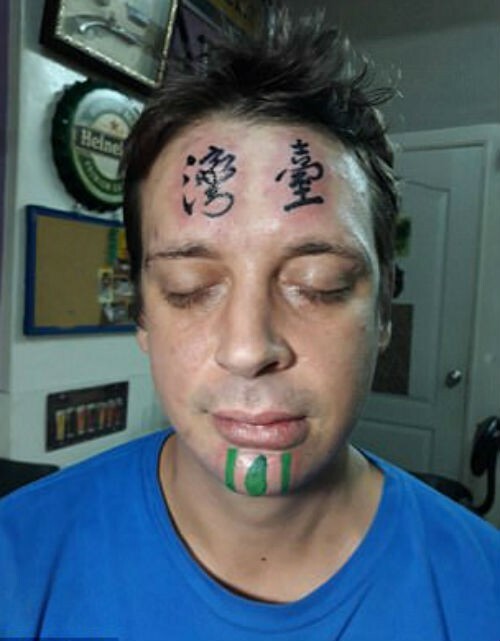 He even had the same green, alternative Taiwan independence flag – made by the World Taiwanese Congress – tattooed on his right arm a year ago. By Paul’s own admission, the rash decision to ink the name of Taiwan on his forehead came during a night of heavy drinking and after a passionate discussion about Taiwan’s independence. 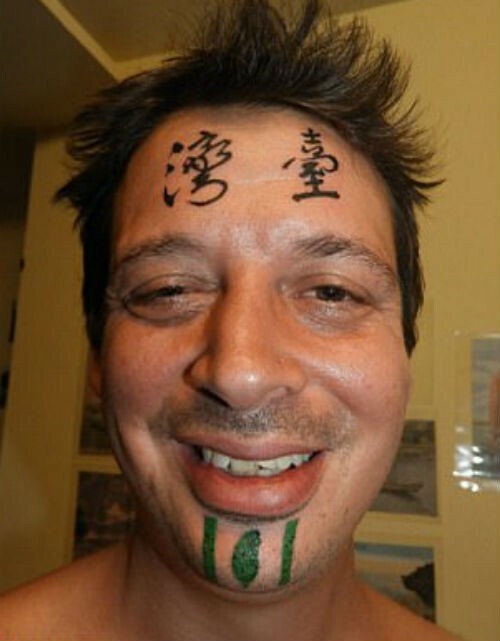 Tattoo artist Wei Cheng, who has been accused of taking advantage of his drunk client, argues that he questioned Paul’s decision numerous times before proceeding with the session. 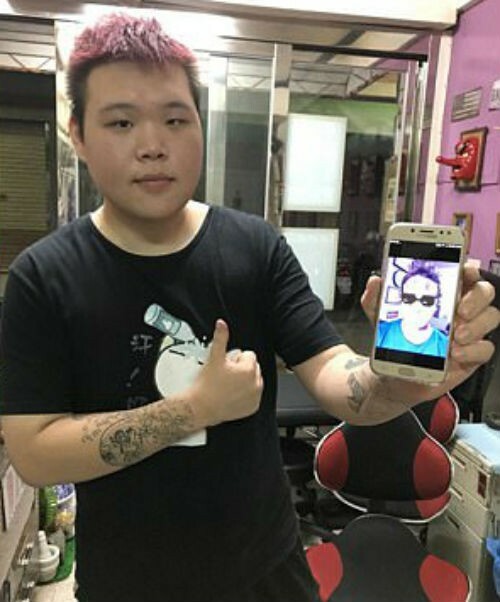 Wei noted that his enthusiastic client even shaved his beard himself before the session and was ‘very pleased’ with the end result, uploading photos of his new tattoo online. The tattooed Brit was arrested for drink driving at some stage after getting the tattoos. The Brit’s wife, however, was not pleased with the ‘artwork’. 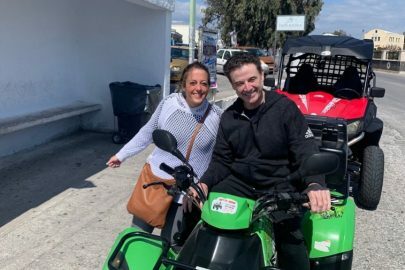 ‘My wife doesn’t like it. She’s very angry,’ Paul told local media in fluent Mandarin. Doctors in Taiwan said it may take 10 painful sessions and 200,000 TWD (5,000 GBP) to have the tattoo lightened via laser treatment, and it will take much more than that to have it fully removed.